Less than a week after releasing its response to the April 2007 Supreme Court ruling that the EPA should take action to assess the risk of greenhouse gas emissions and regulate those emissions unless there is a good scientific reason for not doing so, the EPA issued a report entitled Analyses of the Effects of Global Change on Human Health and Welfare and Human Systems. On one hand the EPA asserts using the Clean Air Act to regulate greenhouse gas emissions would be “irresponsible” and too much of an economic burden and on the other it warns of the “substantial” threats to human health in the coming decades. 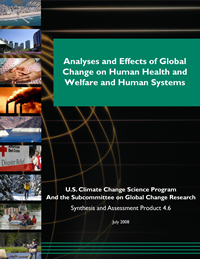 The Analyses report released Thursday outlines potential effects and challenges from climate change, such as more unusually server weather, increased spread of disease and drought, and ever more strained water supplies and distribution systems (particularly in the West and Southwest). Also discussed in the report is the disproportionate vulnerability of specific individuals and communities as a consequence of climate change – elderly, children, people with chronic illness, and the poor. The peer-reviewed report was prepared by The Global Change Research Program within the EPA Office of Research and Development. The program integrates the research of 13 federal agencies on global warming and climate change. The Global Change Research Program’s analyses reflects the initial findings of the EPA’s first draft report from December responding to the Supreme Court ruling. Those findings were changed after apparent political arm-twisting from both the White House and the office of the Vice-President. Given the 120–day comment period for report released July 11th, the EPA has insured that it will take no action on climate change until after Bush and Cheney leave office, effectively kicking the ball down the street for the next president to deal with. The EPA strives to take a very contorted stance on climate change. But it is evident, perhaps, where its heart truly lies. In the meantime we wait for new leadership in Washington. The reality is the EPA is a government controlled agency. Aside from whistle-blowers, the EPA will generally side with the views currently expressed by the white house. The good news is the research is there and people can read for themselves the harmful effects of global warming.